Katama ca sa … sambodhaya nibbanaya samvattati. Right Mindfulness and Right Collectedness. This is the Middle Way that a Tathagata has Awakened to. The frames of the illuminations often come in a pair or triad that form a set, relating to each other in certain ways. The contents of this frame follow from the previous panel; this is what the “Middle Way” is about and how it can be defined in conventional terms. It also continues to approach human life broadly. Here, the Buddha is not formulating a particular set of beliefs or assumptions that you have to take on board before you can understand the teachings; he teaches in a way that is accessible to any religious Path. Coincidentally, at the time of creating these particular paintings, I was in the habit of visiting a small, rarely-used church near the monastery where I was living. The monastery was very busy with renovation work, and in my free time I would go to the nearby church to practice my chanting and meditate. I developed a great appreciation of the calm atmosphere, the simplicity and the sense of dedication within that tiny old church. Such things go beyond the beliefs of any one religion. Remembering this, I have framed the broad outlines of the Buddha’s teaching with the window of the church. The lotus is often used in Buddhist art as a symbol of purity, for the Path is one of purity—the purity of selflessness. The lotus arises from the mud of the ordinary earthbound mind and always turns towards the sun—to that which is higher than low or selfish feelings. In this way, it conveys the mood of the word “ariyo” meaning “noble,” for nobility is the quality in us that rises above pettiness, selfishness and narrow-mindedness. The different aspects of the Path are all characterized as “samma,” meaning “Right,” “Perfect” or “Consummate.” The Buddha is talking about following the principles of being “noble” in different aspects of life. The first factor, Right View (sammaditthi), is concerned with having a proper perspective on life. Right View places wisdom on an experiential, rather than abstract, foundation and is, in turn, the basis for Right Thought or Right Intention. The list continues with “Right”-ness in one’s speech and action. It can be called “virtue.” The last three factors relate to the direct practice of mind cultivation: “vayamo” (effort); “sati” (mindfulness) and “samadhi”(collectedness, concentration). These are most often cultivated through formal meditation exercises. Wisdom, virtue and meditation can be reference points for anyone on the spiritual path. Together they present a complete and integrated approach. Various religions or different ways of cultivating the mind may emphasize one aspect or another. For example, some religions place a great stress on morality and conventions with promises of heavenly rewards for those who obey, and punishment for those who don’t. Such attitudes often omit and may even reject the possibility for personal reflection. Unguided by wisdom, moral commandments lead to fundamentalism with the intolerance, repression and blinkered conceit that it brings about. A subtler attachment to virtue is the belief that if you just keep performing good actions, such as ritual offerings to gods, then this in itself will get you somewhere without any further work on the mind. This affects Buddhism too. In Buddhist countries, there’s a very strong feeling about accumulating “merit” by making offerings to monks or temples. This has a certain truth in it, and was even acknowledged by the Buddha: generosity is a sign of a selfless heart—a great blessing to the world. Unfortunately, the idea of “gaining merit” can substitute for true selflessness, and make one feel that no further cultivation is necessary. 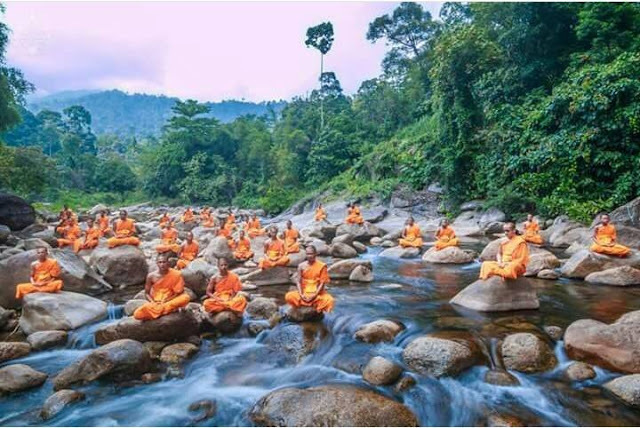 So the Buddha always pointed out that the highest kind of merit, even greater than giving alms to a Buddha, was to cultivate meditation properly. At the other extreme are those who don’t bother with any morality or conventions, and think that they can become enlightened just through sitting in meditation. This is more common in the West. People can get really obsessive about having the right conditions to SIT in, and yet pay no attention to selfless actions, kindness or sense restraint. Meditation becomes motivated by the need for self-affirmation, a drive to attain samadhi, experience bliss or remodel oneself. That’s the meditation fanatic’s attitude! However, a steady and sensitive mind leads to proper understanding and right conduct in daily life. So the Buddha always related meditation, not to ecstatic trances or complex abstractions, but to good sense that would manifest in mundane, as well as transcendent, terms. Then again, wisdom itself can be developed to the point where it loses contact with reality, as in the case of metaphysics. Philosophy and theology rely heavily upon intellectual understanding yet fall short in the development of wisdom through attention to actual experience. So having a mind full of ideas does not necessarily grant one any clearer perspective on how to live one’s life. Even with proper wisdom and virtue, without the assiduous practice of inner contemplation that meditation exercises make possible, one is sowing good seeds but is not tasting the fruit. The Middle Way, that is, the Eightfold Path, is the balance and counterbalance of all the spiritual fundamentals. It summarizes the ways in which one cultivates a spiritual path and then qualifies that with the reminder that the Path is to be cultivated in ways that are “Right.” Consider that bland prefix, “Right.” “Samma” means “whole” or “complete.” It means ways that are not partial, biased or self-oriented, but ways that are of benefit to others as well as to oneself. “Samma” conveys a whole, balanced feeling. This is the “rightness” that is noble rather than perfectionist; and—to consider another meaning of noble—it is also an indication of something rare. If we practice meditation with wrong view, we will always remain obsessed with ourselves—trying to cultivate something for ourselves or simply be mesmerized by a particular problem, vice or virtue. Meditation is not an answer in itself; we need the guidance to ward off the obsessiveness that accumulates around anything that is seen in personal terms. To abandon self-conscious drives and ambitions without abandoning the practice requires skill. How can I, an unawakened worldling with a head full of noise, acquire that skill? How to find that right balance is explained in the subsequent teaching—a teaching that the Buddha said was peculiar to fully enlightened beings. And it’s based upon something that everybody knows about.